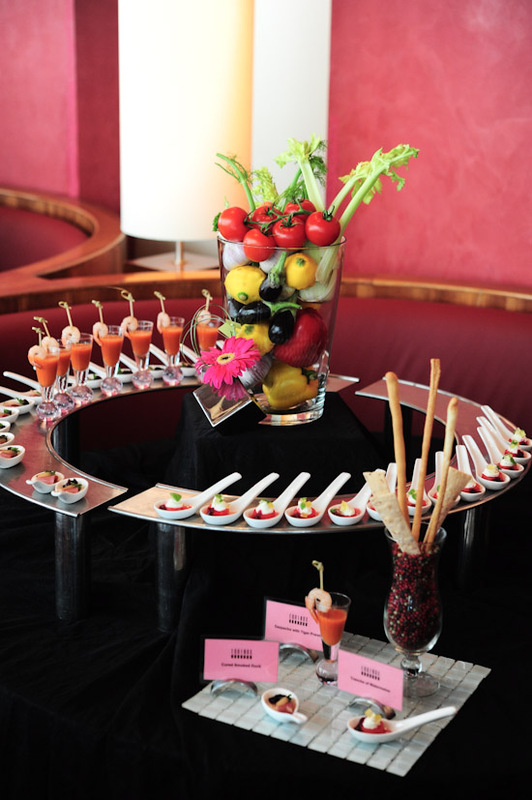 When it comes to Sunday Brunch, there’s nothing better than the Pink Champagne Brunch Buffet at Equinox Restaurant. I’m going to go out on a limb here and say that this is definitely one of the best brunch in Singapore. 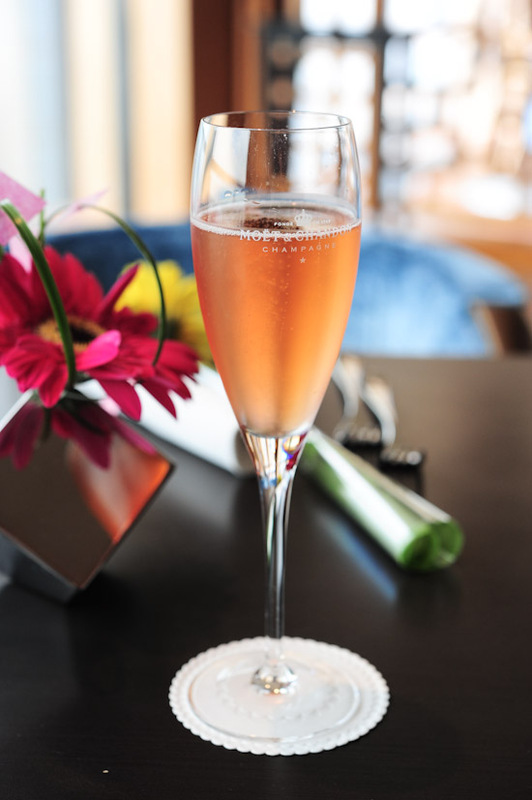 On the last Sunday of each month, the fine dining restaurant at Swissotel the Stamford has a special Pink Champagne Brunch. 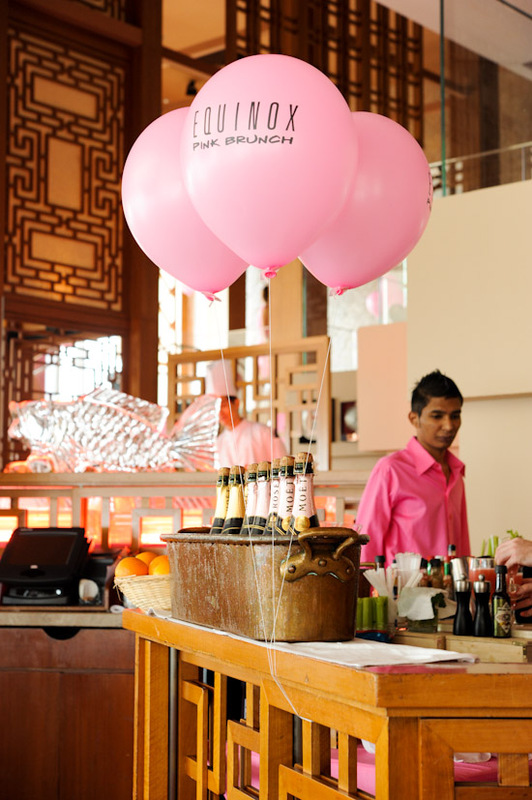 From free flow of Moet & Chandon Rose Brut and pink cocktails, to pink chocolate fountain and staff dressed in hot pink, the Pink Themed Brunch will most definitely lift your mood. Trust me, it almost feels like heaven when you are sipping champagne on the 70th level. Anyone who has been to Equinox knows how beautiful it is. At 70th level of the Equinox Complex, it is one of the restaurants with the best view in Singapore. 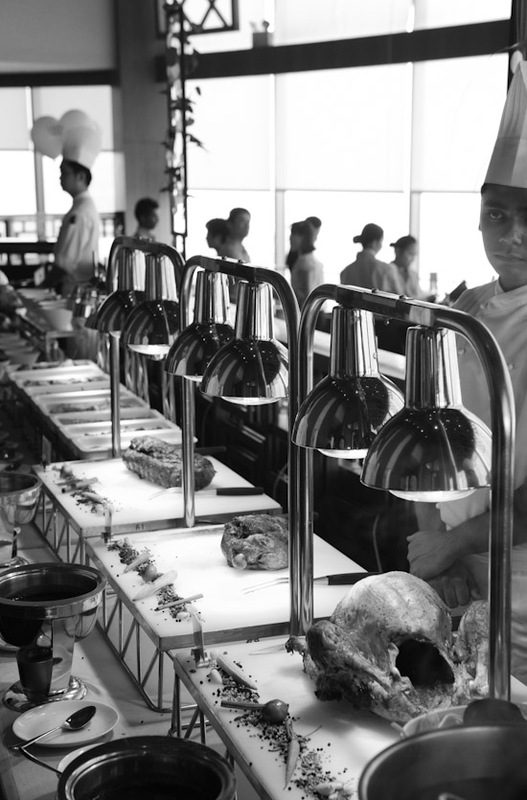 I have a love-hate relationship with buffet as I tend to overeat. But it is impossible to say no to a luxurious Sunday brunch. 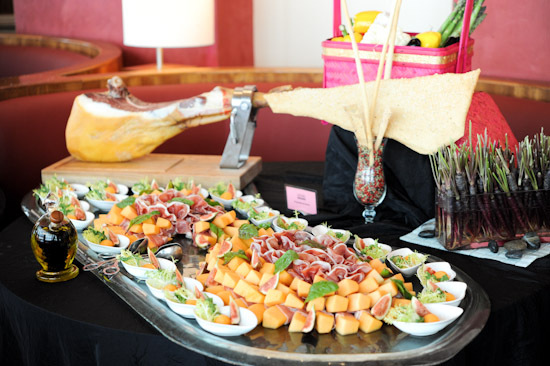 There is an appetiser section where you can start with parma ham & rock melon, as well as an assortment of salads. There is also a corner with shooters like cured smoked duck and chilled gazpacho. Moving on, the Salmon showcase will definitely wow you with the varieties of gravlax, cured, smoked salmon tartar and salmon rillette. 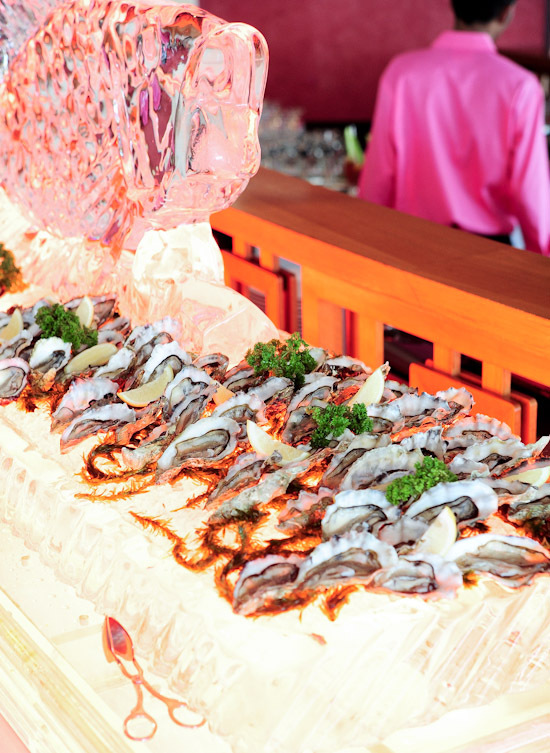 But I was distracted by the Seafood Counter on the rather magnificent ice sculpture. All you can eat seafood: tiger prawns, mud crabs, green lip mussels, fine de clair oysters, white pearl oysters, gillardeau oysters, and slipper lobsters. The Japanese Station is conveniently located beside the seafood area. With Sashimi (Kingfish, Tasmanian Salmon, Yellowfin Tuna, Japanese Scallops, Surf Clam and Octopus) and a selection of Sushi and Maki to choose from, it felt like a mini Japanese buffet. Oh my god. There goes my diet plan. Carnivore alert! The Carving & Live station offers roasted USDA beef rib eye (too dry), roasted turkey (it’s Christmas already?) and leg of lamb (excellent). The highlight of the dessert buffet was definitely the pink chocolate fountain. The nitrogen sorbet that came with the crepes, was equally impressive. Opera cake, raspberry chocolate gateau, maple tree financier, panna cotta, macaron, cream brulee — how did desserts steal all the lovely words? Looking for a birthday venue to throw a pink themed party? Equinox Restaurant is definitely the perfect place! 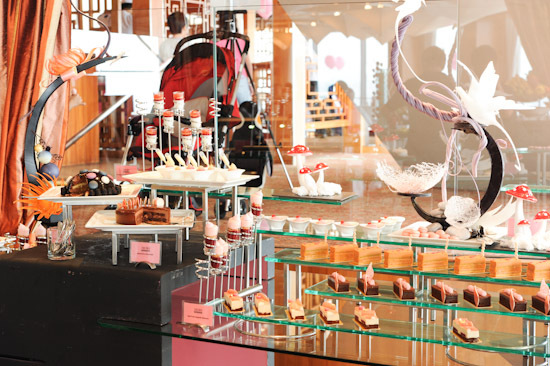 The $148++ Pink Brunch is not cheap, but I think it is worth splurging for that special occasion. Besides the fantastic view of Singapore’s skyline and waterfront, there’s also free flow of champagne with lots of yummy food. 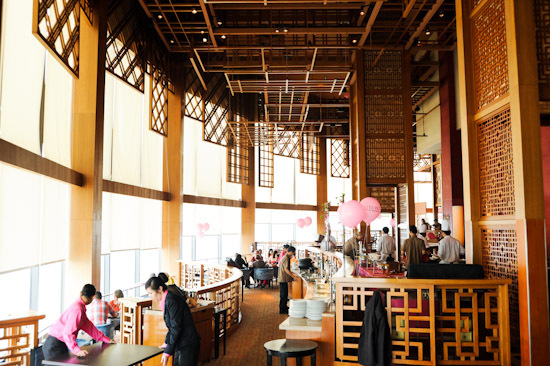 The Pink Brunch at Equinox is very popular, please make a reservation before going. Great place and food selection! After this, Sunday brunch can never be the same! Wow…looks simply stunning..with a stunning price to boot also lol…oh btw..if u can be so kind…just to ask..this blog of urs is it under blogger or wordpress or something else? i would like to put full large photos on my blog but i’m having difficulties doing so and i duno what to do..
AL: i am using wordpress, but blogger can put big photos too. I’m not very familiar with blogger though, try asking around? Would you recommend Equinox or Greenhouse for champange brunch for a foie gras lover? Upon checking equinox is very exciting to dine in with. One of my wish list is to go and experience their cuisine and feel the view.